Scientists have managed to recreate dinosaurs by cloning there DNA. Deciding to create a theme park to show off these dinosaurs, not everything goes to plan. 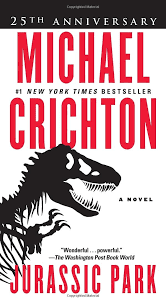 When a catastrophe strikes and the dinosaurs are let loose everyone is left fighting for their lives. These films are my all time favourite films so I thought being an avid reader I would give the book ago, however, I found I didn't enjoy the book. I was listening to the audiobook though and I suspect it was because I wasn't enjoying the narrator who was reading the book. I think this has a huge impact on whether or not you enjoy an audiobook or not. Therefore I have not given up on this book, I will give reading the actual book ago. But I did not like the audio, therefore, my rating is for the audiobook version of this book.